Are you riding in an upcoming Christmas parade or New Year's parade? Here's some last minute parade throw ideas. If you're looking to have the crowds screaming and waving their hands for your throws, then this will be the most important thing you'll read today. Let's face it. It's not a parade without Mardi Gras beads. 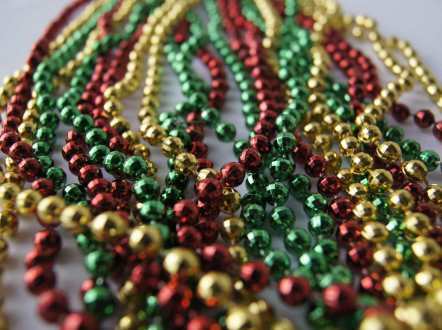 Beads and necklaces are the classic Mardi Gras throw. This includes Christmas and New Year's parades. At Toomey's you'll discover beads in all colors, sizes, and lengths. Red, Gold, Green - The perfect holiday color combination. During Christmas, these are a popular throw. Purple, Gold, and Green - Traditional Mardi Gras colors. Fun to throw. Fun to catch. In every toss you'll be spreading a little bit of tradition. Assorted Colors - There's something for everyone in this bulk box of beads. Of course, you'll find hundreds of styles of beads and necklaces here at Toomey's. Click here to view them all. You'll find a huge assortment of toys that make perfect holiday throws. Rubber balls. Squeaky toys. Light up trinkets. Light up balls. You'll find footballs in all colors. Emoji balls that light up. Emoji balls that squeak. You'll find foam rockets and alligator clappers. Rubber snakes and plastic animals. If you can remember being a kid in a toy store, then that's what you'll feel like choosing your Mardi Gras throw toys from Toomey's. All of the toys are available at the retail store or you can click here to see the toys on this website. Our Mardi Gras Stuffed Animals and Mardi Gras Trinkets come in shapes, sizes, and colors. Mix up your throws with plush animals and toys. You'll have the crowd screaming. Or you can hold up the oversized stuffed animals and put it on display. You'll see the crowd erupt into a frenzy as all eyes turn towards you. Light up trinkets are our new best seller. They're a relatively new Mardi Gras throw and they're gaining in popularity. The parade riders love them and the crowd loves them too. At Toomey's you'll find many choices from light up	plastic sticks to swivel wands. If you want to combine light-up with throwables, then you can choose from light up footballs and light up squeaky balls. What's the 2nd most popular throw during Mardi Gras? It's simple. Candy and moonpies! If you want to see the crowd scream, then hold up a handful of candy. If you want to see the crowd scramble, then toss the candy into the air. The crowd will drop down to the ground and pick up every last piece you threw. Click here for all candy and moonpies.